The starting point of replication, the origin, is close to the binding site of the chromosome to the plasma membrane (Figure 6.4.1). Replication of the DNA is bidirectional—moving away from the origin on both strands of the DNA loop simultaneously. As the new double strands are formed, each origin point moves away from the cell-wall attachment toward opposite ends of the cell. As the cell elongates, the growing membrane aids in the transport of the chromosomes. After the chromosomes have cleared the midpoint of the elongated cell, cytoplasmic separation begins. A septum is formed between the nucleoids from the periphery toward the center of the cell. When the new cell walls are in place, the daughter cells separate. 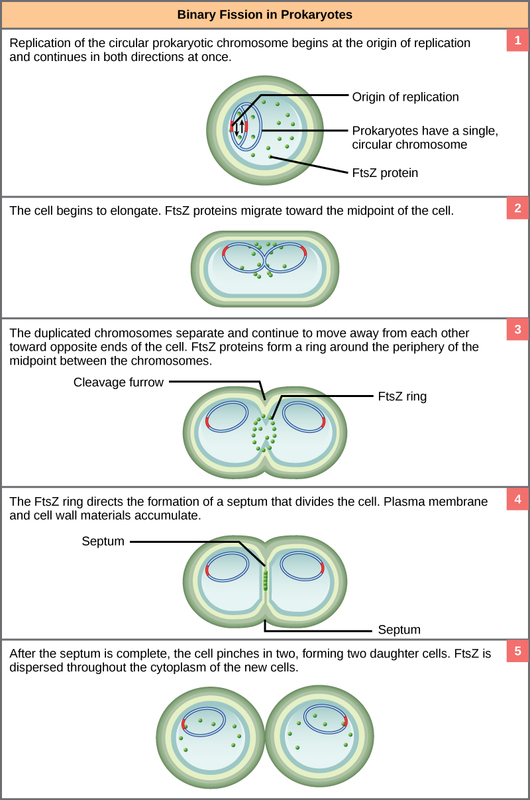 FtsZ and tubulin are an example of homology, structures derived from the same evolutionary origins. In this example, FtsZ is presumed to be similar to the ancestor protein to both the modern FtsZ and tubulin. While both proteins are found in extant organisms, tubulin function has evolved and diversified tremendously since the evolution from its FtsZ-like prokaryotic origin. A survey of cell-division machinery in present-day unicellular eukaryotes reveals crucial intermediary steps to the complex mitotic machinery of multicellular eukaryotes (Table). Animal cells Linear chromosomes exist in the nucleus. A mitotic spindle forms from the centrioles. The nuclear envelope dissolves. Chromosomes attach to the mitotic spindle, which separates them and elongates the cell. Microfilaments form a cleavage furrow that pinches the cell in two.